A web server that handles web page requests from users, processes the request and returns the data. 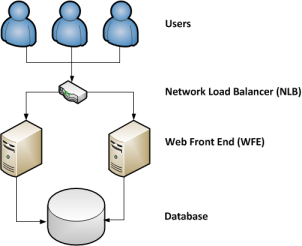 In a farm there can be multiple Web Front End (WFE) servers and a Network Load Balancer (NLB) will distribute requests between them. This is the primary method of scaling in SharePoint - as the number of users grows you add more WFE servers. Is also used to add redundancy - If a WFE fails the NLB can distribute requests to other WFE's.